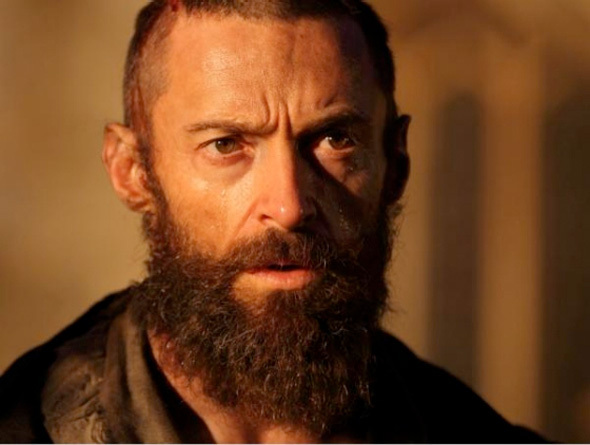 Though some unofficial photos from the set of Tom Hooper's adaptation of Les Miserables have been making their way online thanks to some crafty paparazzi, we finally have an official first look at Hugh Jackman in the film. The actor, now sporting a full Zach Galifianakis worthy beard, tweeted a close-up photo of himself in the adaptation of the musical, similar to our first look at Ryan Gosling in Only God Forgives. Jackman looks the part (despite shorter hair than expected), but since it's a musical, I'm holding out so we can hear him and the whole cast singing on the big screen as opposed to a Broadway stage. Look! Tom Hooper (The King's Speech) is directing Les Miserables, an adaptation of the successful stage musical based on Victor Hugo's classic novel set in 19th-century France, in which a paroled prisoner named Jean Valjean (Hugh Jackman) seeks redemption. Alain Boublil adapted his own work with Claude-Michel Schonberg, who also wrote the stage musical, Herbert Kretzmer and William Nicholson. The film also stars Russell Crowe, Anne Hathaway, Amanda Seyfried, Helena Bonham Carter, Sacha Baron Cohen and Eddie Redmayne and will hit theaters everywhere in 3D on December 14th, 2012 later this year. Good stuff? Interested in more, but looks good so far. Looks rather incredible, can't wait to hear him sing now. no hell of a beard? Great cast, and I liked Cohen in Sweeney Todd, so bring it on! He's not really big enough to play the character is he? I mean, Valjean is meant to be a very tall and broad man. Uh, Hugh Jackman is 6'2". I don't think this is a problem. I'll be damned. lol I take back what I said. I don't know why he always looked so stocky to me. Maybe it's the whole Wolverine thing... Admittedly I have no doubt he could pull of the roll acting-wise, but for some reason he doesn't fit it for me.